This small (unsurfaced) layby is situated on the eastern side of the junction of the B6318 Military Road and a minor road leading to East Matfen. This one is mainly for fans of the ditch. As ever, be aware that there are car thieves operating, as there are at all of the car parks along the Wall. Stout footwear is advisable. To the south, beyond the Military Road, the line of the Vallum can be made out, surviving as an upstanding (if slighted) earthwork. 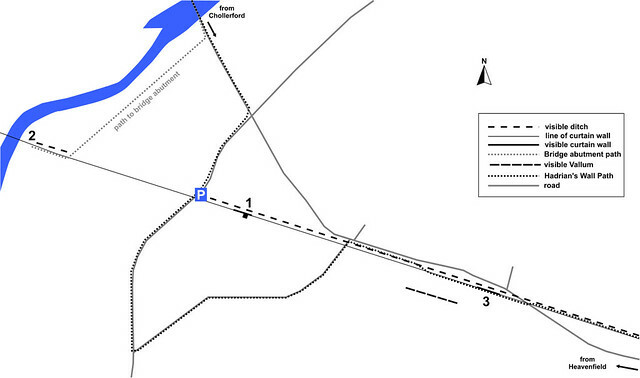 To the east, the Trail follows the substantial remains of the ditch (1), as indeed it does to the west (2). More ditch can be followed to the west (3), as well as to the east, with the opportunity to walk in it immediately to the west of the Robin Hood Inn (4). This large (unsurfaced) layby (with room for more than 10 cars) is situated opposite Carr Hill Farm and is often used by cars, lorries, and coaches. The line of the Wall ditch can just be made out over the hedge from the layby (1). The upstanding earthworks of the Vallum between Carr Hill and Down Hill (2) are clearly visible. 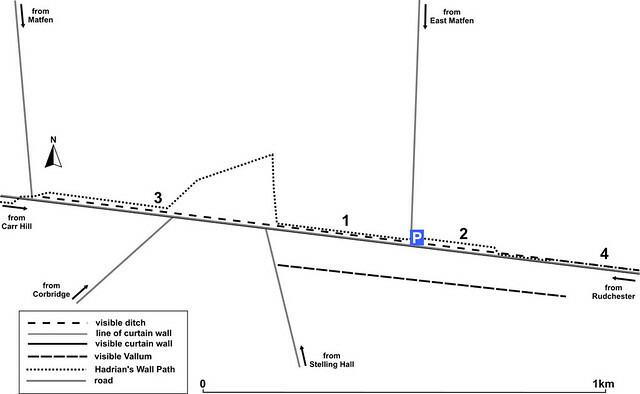 One of the finest sections of the Vallum is immediately next to the Trail on the limestone outcrop of Down Hill (3). 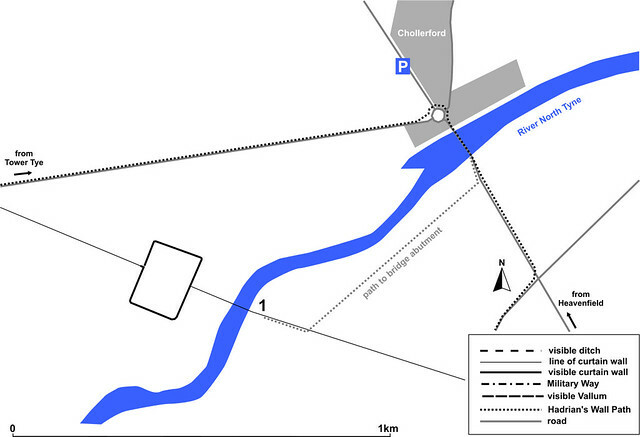 The determined can press on to inspect the humps and bumps that are all there is to be seen of Haltonchesters fort (4). This small layby (with room for a maximum of about 4 cars) is presumably principally intended for visitors to Heavenfield Chapel, but it has other uses too. Walking northwards leads to Heavenfield Chapel and its Roman altar (1). Heading eastwards along the Trail reveals a spectacular length of ditch (2) and a view of the Vallum (in the field opposite St Oswald’s Tearoom). Heading westwards along the trail, down the hill, and across the Military Road, brings the visitor to the important section of curtain wall at Planetrees (3). Continuing eastwards on the Trail produces more of this long section of ditch and upcast mound (4). There is no official (or even unofficial) car park for visitors to the length of curtain wall at Heddon cared for by English Heritage, which is both a shame and a puzzling oversight. There is a layby plastered with the words COACHES ONLY (oops! ), which is not very helpful unless you happen to have a coach handy. The only alternative is to park on the street and try not to annoy the locals in doing so. I tend to park in Marius Avenue whenever I go. 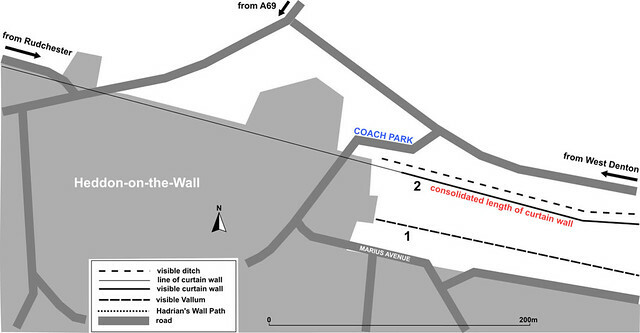 As ever, be aware that there are car thieves operating, as there are at all of the car parks along the Wall. Stout footwear is scarcely necessary. If you park in Marius Avenue, you can peek over the hedge at the slight, but nevertheless detectable, remains of the Vallum (1). Assuming you park somewhere in the village, you can now amble along and look at the splendid section of curtain wall (2), preserved from destruction by dint of the very existence of Heddon, the Military Road being forced to detour round it. This layby on the eastern carriageway of the A6079 (between its crossroads with the B6318 Military Road and the village of Wall) provides parking for visitors to Brunton Turret, which is in the care of English Heritage. As ever, be aware that there are car thieves operating, as there are at all of the car parks along the Wall. Stout footwear is unlikely to be necessary to visit either the turret or the bridge unless the ground is damp underfoot, but is advisable if extending your visit to Planetrees. Walking eastwards across the field from the layby brings the visitor to an interesting consolidated section of curtain wall either side of Brunton Turret (T26b) (1). Walking north-eastwards and then north-westwards along the B6318 affords access to the Chesters Bridge Abutment (2 although it can more easily be reached from the Chollerford layby). Following the trail south-westwards along the A6079 towards Wall and then up the unclassified road signposted to High Brunton will lead to the important piece of curtain wall at Planetrees (3). This simple layby on the B6320 (signposted Otterburn and Bellingham at the roundabout), near the village of Chollerford, has enough room for about 8 cars and is useful for a visit to Chesters Bridge Abutment. As ever, be aware that there are car thieves operating, as there are at all of the car parks along the Wall. Stout footwear is unlikely to be necessary to visit the bridge unless the ground is damp underfoot. Walking south-eastwards and across Chollerford Bridge brings the visitor to the gateway leading to the path for Chesters Bridge Abutment (1). Located on the verge, this is an unofficial pull-in, but you will see lots of people using it, from passing motorists to coach drivers. The main virtue of this location is that it affords easy access to Milecastle 29 (1) and its splendid earthworks. The fine stretch of consolidated curtain wall at Black Carts is visible to either side of Turret 29a (2) only a short walk to the west. A further stretch of curtain wall (3) is visible west of a minor road. Limestone Corner (4) with its unfinished ditch and giant monolithic debris can also be reached.